The New London Ledge Lighthouse is a unique structure guarding the entrance to Connecticut’s New London Harbor and the mouth of the Thames River. The busy harbor was originally marked by the New London Harbor Light in 1761, however the light was located to far inland to warn of the ledges and shoals on the approach to the harbor. The Light House Board contemplated building a lighthouse at this location since the 1850’s, but it would be another 50 years until their plans were realized. The Lighthouse Board made its original request for funding to build the New London Ledge Lighthouse and fog station in 1890. They repeated the request 11 times until Congress finally appropriated $60,000 towards the project in 1904. The contract to build the light was awarded to the T.A. Scott Company of New London in 1908. T.A. 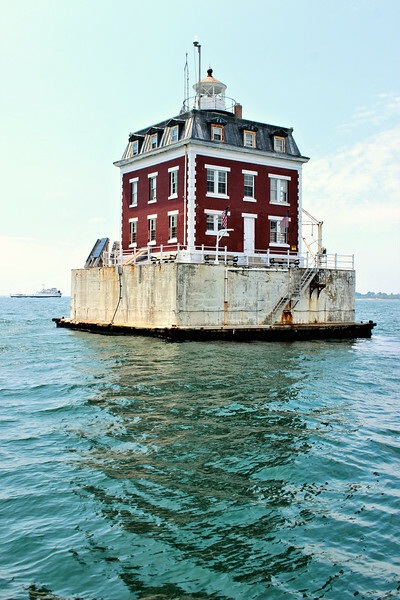 Scott also built the Race Rock Lighthouse in Long Island Sound. Additional funding was appropriated in 1909.